Chiles Stanton: Hello James! Hi, Mrs. Kelly! Would you mind signing this for me, please? Chiles Stanton: Thank you so much! If you have any advice for a young artist such as myself, I'd love to hear it. Kelly Canter: K: Oh, I have some advice. Chiles Stanton: And James is being so helpful! I won't sell it on e-Bay or anything, I've just been a fan of yours since I was a little girl. Kelly Canter: Thank you. Thank you so much. Tim McGraw appears courtesy of Curb Records, Inc.
Q: Who made the white guitar strap in the trailer of the movie? Was it made just for the movie? I just saw this movie today. I cannot understand why it was rated so poorly and it just shows that I am glad I don't listen to the critics. There are so many that don't like it because they compare it to past movies that are somewhat similar. 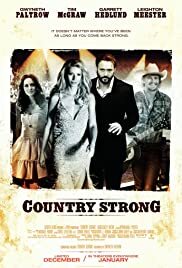 I have seen very few movies like this especially ones that are based on country so I came in very unbiased. Just take the movie for what it is...on it's own...for a great script and story! The acting was sensational. The singing which was done by the actors themselves was fabulously passionate and real. Gwyneth, Garrett, and especially Leighton...WOW! The story line??? Big deal if it is "similar" to others. This movie seemed so very real to what it could actually be like. Gwyneth's acceptance to "be" the character she has to be was remarkable. She had humor...terrific talent and as a woman/wife who's husband had forgotten how to be a husband and partner (no offense Tim...you were great too)...she was passionate and playful yet sad and lost. Once again she showed how wonderful and talented an actress she really is. Garrett and Leighton played their roles very professionally...very real and we need to see more of them. I love this movie. It had a profound affect on me being a musician and someone who had felt the "loss of hope" the exact same way Kelly did in this movie. If the critics hadn't beaten it up so much...this movie would have rocked at the box office! Top marks to all involved. Thank you for doing this! 67 of 92 people found this review helpful. Was this review helpful to you?